Chicago city officials on Thursday ordered the Empire actor Jussie Smollett to pay $130,000 to cover the cost of the investigation into his report of a street attack that police say was staged to promote his career, Guardian reports. A letter from the city’s legal department to Smollett and his attorneys said that figure covers overtime worked by more than two dozen detectives and officers who spent weeks looking into Smollett’s claim in January, including reviewing video and physical evidence and conducting interviews. Those resources, the letter said, “could have been used for other investigations”. Hours earlier, Donald Trump tweeted that the FBI and the Department of Justice would review the “outrageous” case, calling it an “embarrassment” to the country. Prosecutors infuriated the Chicago mayor, Rahm Emanuel, and the police chief this week when they abruptly dropped 16 felony counts that accused Smollett of making a false police report about being the target of a racist, anti-gay attack in January. The justice department sometimes brings federal cases after state prosecutors have declined to file charges, including after police shootings that the federal government believes might constitute civil rights violations. But department policy generally restricts prosecutors from bringing federal charges after state charges have been resolved, unless they can establish that the potential crime at issue is a federal one and involves “a substantial federal interest”. Investigators believe Smollett, who is black and openly gay, hired two brothers to stage the 29 January attack in downtown Chicago and that Smollett hoped the attention would help advance his career by provoking public concern. Police also allege that before the attack, Smollett sent a letter that faked threats against himself to the Chicago television studio where Empire is shot. In return, prosecutors said, the actor agreed to let the city keep his $10,000 in bail. 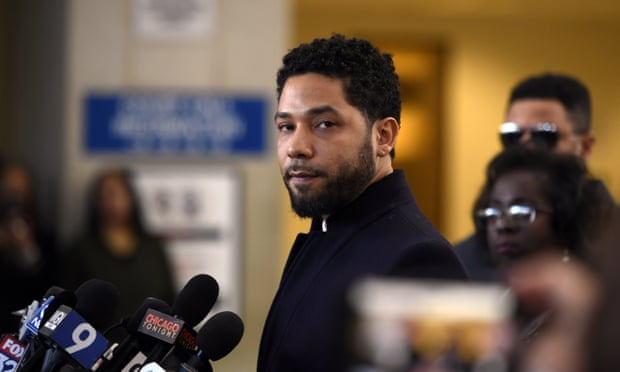 During Thursday’s court hearing, prosecutors promised to notify media outlets if Smollett’s lawyers tried to expunge his record.